Contact: joe@lubaantune.com, or emery@joeyost.com . 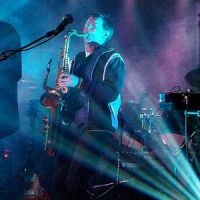 Additional Info: Began study of sax at age 9 and have performed in jazz bands, shows, blues rock and pop acts and recently world music projects. Specialties include tenor, alto, as well as guitar and piano skills. Recently recorded tenor sax for" Nanigi" on the Garifuna Drum Method (www.lubaantune.com). Performed and toured extensively with a Pink Floyd tribute band.